We are pleased to introduce Colby Blaine, who will be our Court Monitor Director for this summer's Fast Eddy's BAM Jam. He joins a great list of Court Monitor Directors that have done an excellent job during the previous 6 tournaments. Colby is a Boise native and a graduate of Boise High School. He earned his bachelor's degree from Western Montana and then his Master's in Athletic Administration from Idaho State. He is currently the assistant coach at the College of Idaho and has a lot of experience operating and managing basketball tournaments and camps. Court Monitors will receive t-shirts, gear from STADIA Clothing, lunch both Saturday and Sunday from Pita Pit and Old Chicago, a parking pass to park at the event and you get to keep your court's basketball! Plus we provide complete court monitor training and support through out the event. If you would like to send Colby a message, you can email him at cblaine35@gmail.com. 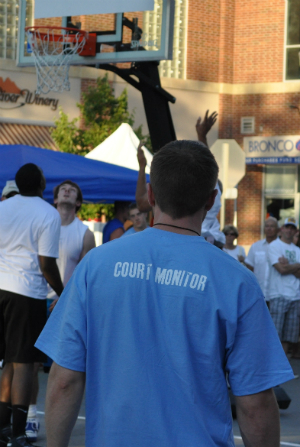 Or you can register to become a court monitor at www.bamjamboise.com/volunteer.